The children and staff of the Refugio are always happy about people who want to support their work. With us you can volunteer in Ecuador for free, you just have to finance your own travel and accommodation. We are looking for volunteers who want to work at the Refugio for at least 2 months. Help is needed in the pedagogical area: spending time with the kids, playing, doing crafts, helping with homework, teaching English, resolving conflicts, and working in specific areas (garden, bakery, etc.) according to experience. Volunteers need to work within our pedagogical framework that is based on the educational concept of Montessori, Children's Rights, respect, love, and personal development. They will be supervised by the Refugio’s staff. In addition, local volunteers in Quito (German-, English- and Spanish-speaking) offer organizational/administrational support, training, emotional support, intercultural mediation, according to their availability. If you are a professional with a degree in social work, or if you want to do a professional internship for your degree, please contact us to individually plan your tasks and your time with us for making your own experiences as a volunteer in Ecuador. You would work from Monday to Friday from 10am to 5pm. Most children come to the Refugio after noon, but some study only in the afternoons and come to the Refugio in the morning. Your main job will be to spend quality time with the kids. Almost none of them are used to being taken seriously, to being listened to, or to being asked for their opinions outside the Refugio. Giving them your attention, explaining a new game to them, teaching a new craft or learning one from them, teaching them music (and learning their songs), helping with their English homework while they help you with your Spanish – all that is part of the job. There’s also the organic garden that needs to be cared for, the fully-equipped bakery ready to prepare some delicious bread, the carpentry shop, and the computer room. You are welcome to contribute your own knowledge and experience, applying your skills to the wellbeing of these children. You should also be ready to join the staff in simple everyday maintenance activities such as sweeping the floor or washing the dishes. Hard-working, committed and serious about making a difference. Open to new experiences and to living in a foreign culture. 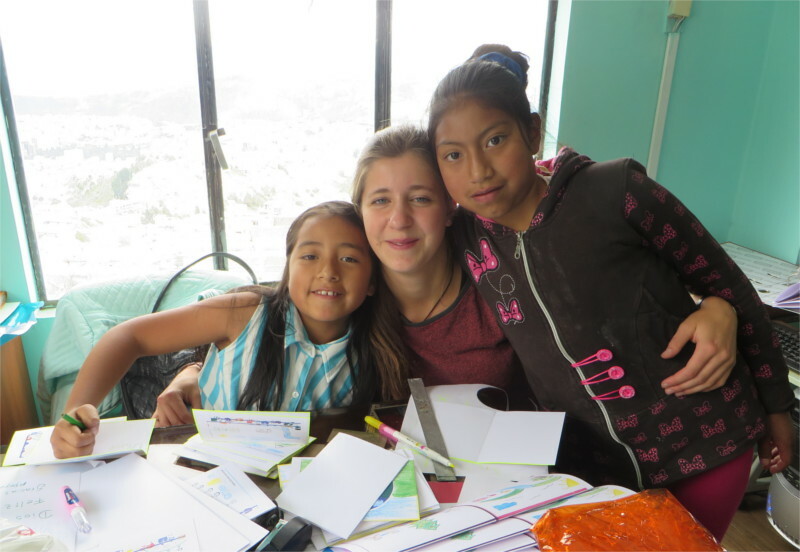 Local volunteers support the Refugio with their volunteer program in Ecuador and offer support for organizing your stay here in Quito within our abilities. Arrival in Quito: Someone will meet you at the airport and make sure you get settled on your first day. We will help you to acclimatize, to move independently by bus and taxi, and find what you need in Quito. Cost: At the Refugio you can volunteer for free in Ecuador. There is no cost. You just have to organize and pay for your own travel and accommodation. Housing: We can help you find housing in Quito, for example in shared housing or with a family. Costs are usually between $ 180 and $ 400 per month (meals not included). Visa: If you stay for 3 months or less, you can obtain a tourist visa upon entry. If you stay for 3 to 6 months, you can apply for an extension after your 3-month tourist visa expires. If you stay longer than 6 months, you need a volunteer visa, which you need to get from an Ecuadorian consulate in your home country. International Medical Insurance: You must get your own international medical insurance which covers you during your stay in Ecuador. Training: During your first days we will make sure that you understand your job and responsibilities in the Refugio, how everything works, whom to ask if you have questions or problems. Our goal is that you feel secure and comfortable working in the Refugio. Emergency: Whether you’re having an emotional crisis or just lost your passport: The staff and local volunteers will try to support you in any way they can. Time off: If you need time off because you want to travel or receive visitors that can be arranged. But please understand that we are expecting a full-time commitment from our volunteers during their time with us. Plan your long travels and vacations before or after your service. Certificate: At the end of your volunteer service we can give you a certificate as a confirmation or an assessment about your time in the Refugio. Closing Time: Please note that the Refugio is closed from mid-August to mid-September and during Christmas break. During that time no volunteer service is possible. Travel: If you want to travel in Ecuador and/or to Galapagos before or after your volunteer service, we can help you. One of our supporters is a local tour operator that offers special rates for our volunteers. We will then invite you to an interview via Skype. If you get accepted, you will also need to send us a police record and sign our volunteer agreement.